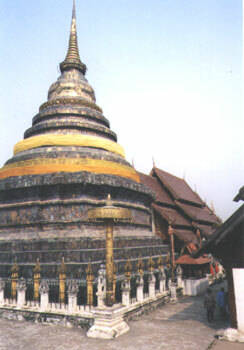 The Main Chedi at Wat Phra That Lampang Luang, one of the most famous temples in Northern Thailand. A chedi is a solid structure encasing a relic of the Buddha or ashes of a king. The subtle green and blue hues of the 15th century chedi derive from the oxidation of its unique copper covering. A hair of the Buddha is said to be contained within.